Long before the rights and freedoms proclaimed in the Universal Declaration of Human Rights (UDHR) became binding as a matter of international law, they were endowed with full normativity and justiciability in German domestic law by virtue of having been internalised in (West-) Germany’s 1949 Constitution. 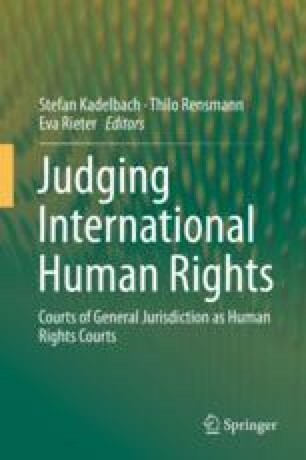 Germany thus became a pilot project for domestic courts exercising their new role as trustees of the observance of international human rights. Under the guardianship of the Federal Constitutional Court (FCC), German courts made a significant contribution to overcoming the legacy of the Nazi dictatorship by firmly entrenching human rights in German law and society. It was, however, not only in this domestic sense that German courts, and in particular the FCC, evolved into international human rights courts. The FCC’s fundamental rights jurisprudence fleshed out important doctrinal aspects of international human rights law and thereby exerted significant influence on the European Court of Human Rights, as well as many constitutional and supreme courts around the world. However, it is only in its more recent jurisprudence that the FCC has started to reflect on and adapt to the increasingly transnational dimension of its role as a human rights court.